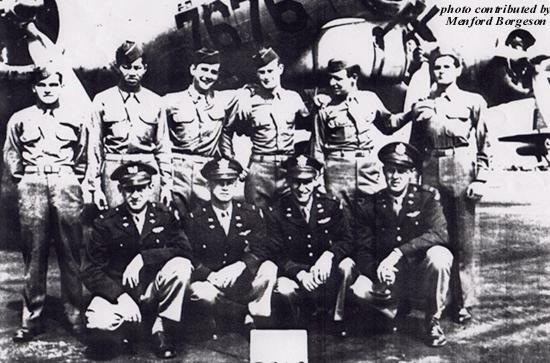 Carl Ducklinsky, Ball Turret Gunner; George Wong, Waist Gunner; Richard Melcher, Tail Gunner; Conrad Lohoefer, Engineer/Top Turret Gunner; Conner Hicks, Armor Gunner; Jack Rubenfeld, Radio Operator/Waist Gunner. 2nd Lt. Robert Harris, Bombardier; 2nd Lt. Eugene Johnson, Navigator; 2nd Lt. Clinton Knighton, Co-pilot; 2nd Lt. Menford Borgeson, Pilot. Check out high magnification of "Old Battle Axe" in right wing lead. Old Battle Axe Factoid - This crew flew their missions between 27 November 1944 and 21 March 1945. Most of their missions were flown in the B17G "Old Battle Axe." Note: George Wong was lost in action over Stendal, Germany on his last mission.